For 61 years now, the DOST-Forest Products Research and Development Institute (DOST-FPRDI) has been helping players in the construction and wood-based industries assess how strong their materials are and how fit these are for different uses. Thru its Physics and Mechanics Testing Laboratory, DOST-FPRDI assesses the physical and strength qualities of concrete hollow blocks, cylinders, and panels; composite boards; pallets; lumber; and non-wood forest products like bamboo, rattan, and vines. Last year, the lab served 248 clients, and earned Php 337,000 in income. "Our customers ask us to appraise their products as required by their suppliers. Using modern equipment, we follow the test methods of the International Organization for Standardization (ISO), the American Society for Testing and Materials (ASTM), and the Philippine National Standards (PNS)," says Ms. Elvina O. Bondad. "The test results show customers whether or not their materials are fit for their intended purposes." "Our strength properties tests, on the other hand, can tell if the material can be used for structural purposes. They tell how much load it can carry and whether or not it can resist being deformed or crushed by such loads, " adds Bondad. 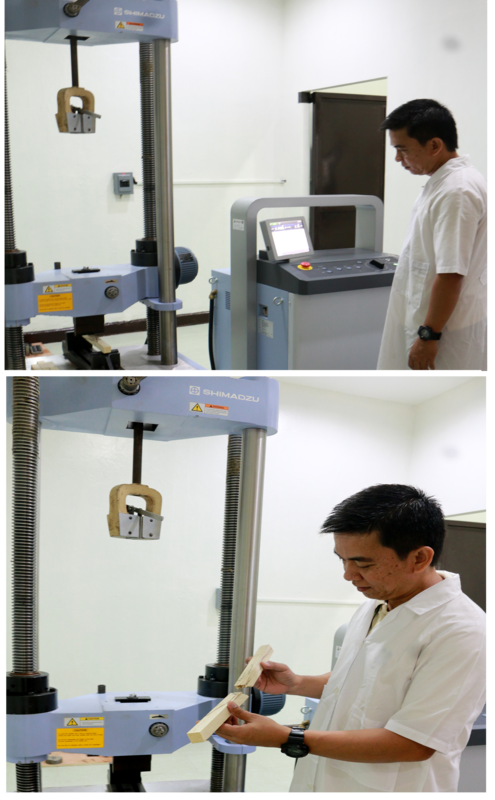 The Physics and Mechanics testing lab is equipped with state-of-the-art machines.